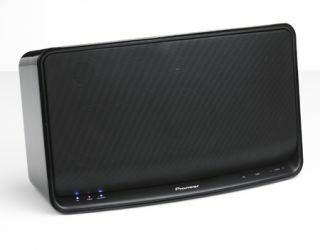 Pioneer presents a new line-up of AirPlay speakers | What Hi-Fi? Yesterday Philips unveiled its new Fidelio range of wireless speaker systems, and today it's the turn of Pioneer with three AirPlay/DLNA speakers. The line-up consists of the splash-proof XW-SMA3 (£300) with rechargeable battery, the larger, more powerful XW-SMA4 (£350) and the compact, entry-level XW-SMA1 (£250). All three feature AirPlay, DLNA and wi-fi and are driven by a Class D digital amp. Using AirPlay, the systems can stream music from a Mac, PC, iPad, iPhone or iPod Touch. Owners of Android devcies can stream via DLNA. They all use Wireless Direct technology, so users can stream their music without using a wireless router. Pioneer says the new wireless speaker range has been engineered "to provide clear, natural and powerful audio in an attractive, minimalist housing". They incorporate two 3in midrange drivers, a 1in tweeter and central bass refex port. The larger XW-SMA4 (above) adds an extra tweeter, and a 4in subwoofer for deeper bass. It will be available in August, along with the XW-SMA1, while the XW-SMA3 follows in September.